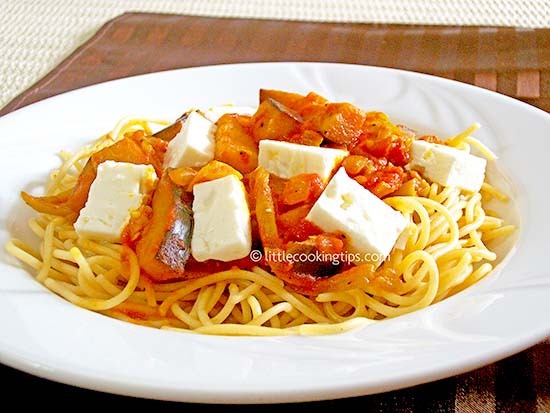 ﻿ Spaghetti with eggplants: A Greek recipe for eggplant pasta! One of our favourite summer recipes for pasta is spaghetti with eggplants and green bell peppers. Eggplants (also known as aubergines or brinjal), along with the bell peppers and olive oil, play an important role in a Mediterranean diet. In the Greek cuisine, eggplants are often combined with feta cheese (usually crumbled). Feta provides saltiness and softens the intense taste of the eggpalnts and the peppers. Adding feta is a common Greek cooking method used in fried or baked eggplants. Spaghetti with eggplants and peppers is a healthy vegetarian recipe. What makes this pasta dish even more nutritious, is the use of whole wheat pasta. The type of pasta we prefer for this Mediterranean recipe is spaghettini (thin spaghetti) Nr.3. Besides the nutritional benefits (vitamins, antioxidants), whole wheat pasta adds a lot of taste to this dish, enriching its flavors, so we urge you to consider it! The tomato sauce that will combine our vegetables into a beautiful result is a classic sauce made with grated tomatoes, tomato paste, olive oil, garlic and onion. We also use a bit of turmeric that is enhancing the taste and is also very beneficial as an antioxidant. What we also love about this dish is that it's easy and quick to make, using simple ingredients that are easy to find. So let's start cooking it! Boil the spaghettini in the water (add salt). Try to boil the spaghettini al dente. This means that it must be soft/tender but also slightly firm when you bite it. When ready, drain, put the spaghettini back in the pot and add the margarine/butter. Stir well until the butter melts. Add the olive oil in a frying pan or a medium-sized pot and put it on medium to high heat. Add the onion and the peppers and saute until soft (about 4 minutes). Add the eggplants and the garlic and continue to saute for 8-10 minutes more. Once the vegetables are soft, pour the tomato, the tomato paste, the cup of water and add the turmeric. Reduce the heat to medium-low and cook until most of the water is evaporated and the sauce thickens. Add salt and pepper. Serve adding the feta cheese cubes. Kali oreksi! 1. You can also grate the feta cheese on top of the dish instead of adding it in cubes. 2. You have to select a type of feta cheese that is not very salty. If it is, reduce the amount of salt used during cooking. I love this recipe, I think it's a great way to introduce veggies to kids. I will definitely try this one (I think I like my feta cheese in cubes, better). We bet they 'll love it, along with some feta! Also check our new recipe today, it's a great way to make kids eat veggies and enjoy them! Thank you!